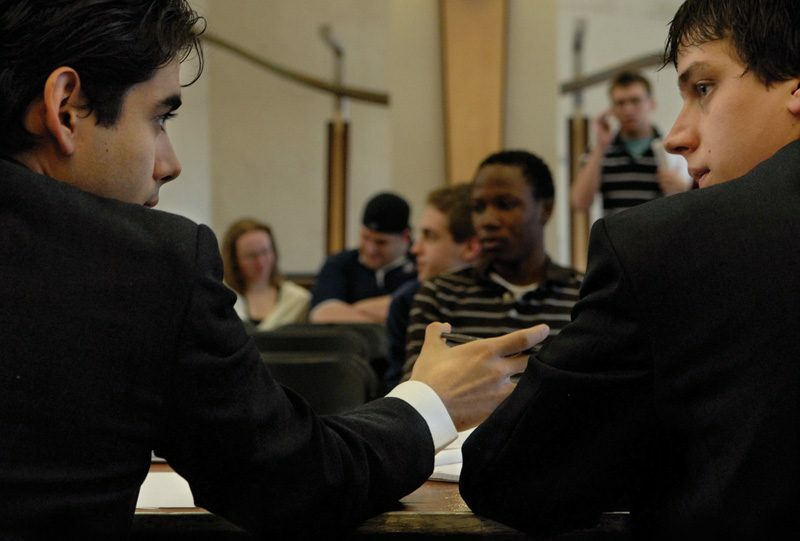 The race for Student Government President heated up at the debates on April 8th and 9th. Candidates presented their plans on issues such as the parking crunch, the relationship between clubs and SG, and financial issues. “When we saw the candidate list, we didn't see enough strong leadership” in the race, said Ed Wolf, who is running for reelection as SG President. Representative at Large Matt Danna is his running mate. Wolf and Danna are basing their campaign on their good relationships with other groups on campus, and their accomplishments in office. In his platform, Wolf lists rewriting club guidelines, free laundry, and increased e-mail among his accomplishments. Carlos Cornejo, currently the College of Buisness Senator is running with Stephen DeVay, the Greek Council Representative. His major platform points include changing the way clubs relate to SG and resolving parking and housing issues. Cornejo has also promised to make food debit “roll over” and not expire at the end of the quarter. “There are a lot of students who need special software to do their homework,” said Hazzard, “so we think [the 24/7 computer lab] is necessary. We've estimated it will cost between three and five million dollars. Considering the size of the student body, it's a drop in the hat.” Hazzard said that the lab will contain up to 150 computers. At one point during the debate, the Cornejo camp promised to “stand up for student opinions and fight with the Academic Senate if necessary. The current government backs down repeatedly,” they said. In a later interview, they cited the dates of this year's graduation ceremony, to be held on the Friday evening and Saturday immediately after final exams. According to Cornejo, most students wanted it on Saturday and Sunday. “I don't think it's right for the president to bring his opinion to the forum. I think it's important for him to be impartial toward the Senate.” he said. Wolf acknowledges asking the Senate to change the dates of graduation, but denies that it was improper. “We are responsible for making sure student tuition money is spent responsibly and I didn't think it was fiscally responsible to invest all this money when the issue could have been resolved” by changing the dates, he said. Because of additional staffing issues, “the old plan would have cost a million dollars” more than the current plan, he remarked. Deyhim's campaign has also faced criticism. During the debates, Danna said, “Through [Deyhim's] campaign, he has been making a mockery of SG... It's almost insulting.” Referencing Deyhim's campaign fliers, Danna said, “It's the fact that he says he like bunnies and is against volcanoes. Most people have actual goals.” Others, such as current GCCIS Senator Paul Solt, who is not running this year, pointed out Deyhim's lack of SG experience and claimed that he is ignorant of SG issues.